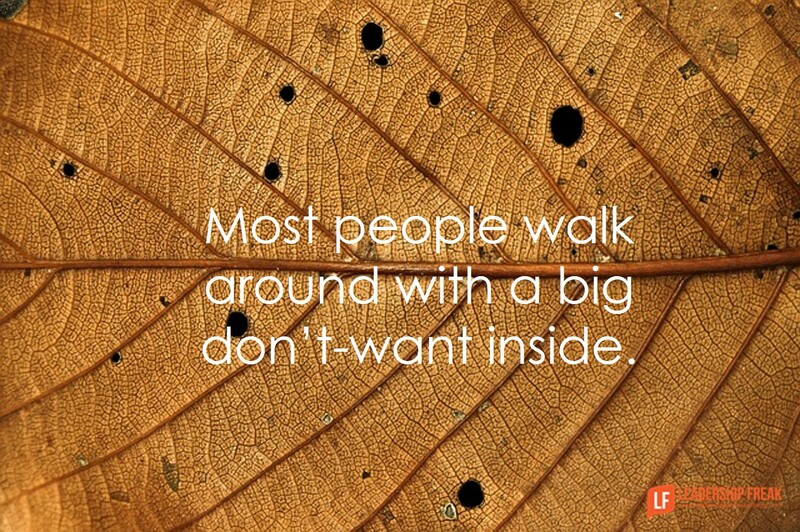 Most people walk around with a big don’t-want inside. When I ask people what they want, they inevitably tell me what they don’t want. Frustration and pain point the way for don’t-want leaders. Some disguise a don’t-want as a do-want. One of the most common ways leaders disguise their don’t wants is by wanting less of something. “I want less stress,” for example. It’s difficult, but safe, to pursue less of something. Some run from the reality and responsibility of what they really want by focusing on what they want from others. “I want the people on my team to step up and take more responsibility.” Don’t-want leaders sabotage themselves by taking more control in order to help people step up. It’s safe to want others to change. What are my positive aspirations for myself? What am I doing that sabotages my aspirations? How do I need to change my assumptions? Uncovering what you really want is like giving birth. It hurts. You push through distraction, doubt, ignorance, and fear before the truth emerges. The desire for less stress might become calmness in spirit. More deeply, it might be living purposefully. Do-want leaders explore what matters. The transition from ‘how to do’ to ‘what matters now’ became clear to me while composing an email to a leader. He received feedback that he wasn’t as good a listener as he thought. We might rush to learn ways to be a better listener. Perhaps listening is about helping people feel heard. It’s vulnerable and courageous to ask, “What needs to change about me that helps people feel heard?” More deeply, why even care if people feel heard? How do you uncover what you really want? How might leaders help others move from don’t-want to do-want? This ideal of want to versus have to has and is gaining traction across businesses. This is pretty amazing to me; we all have things in life and in work that we want to, need to and have to. I don’t need to change verbiage to I want to too ensure I do good work or get things done efficiently and effectively. I believe we use it as an excuse to avoid doing what’s right. I also this it allows people get off the hook (so to speak) for taking responsibility and accountably for not getting things done the right way. Thanks Jim. The ideas of want to, have to, and need to, is a wonderful expantion of this topic. It isn’t simply about want to. Of course, the more fully aligned we align our ‘want to’ with our ‘have to’ the better life and leadership becomes. The pangs of giving birth to leadership. Right on. Thanks Pilgrim. Lots of ‘labor’. Thanks for this read Jim. #4 is the one that changed my life. My “why”. Very simply, my “why” is that God told me I have something to share with others and it would be selfish to keep it to myself. He gave me the tools, attitude and talent. Being in service to others allows me to place value on them and makes me less judgemental. Thanks for the thoughtful article! This was exactly what I needed to read this morning. My station in life, involves a lot of listening, listening deeply and intuitively. Lately I have been feeling burnt out, cynical and very curt as a result of how I feel. Its not so much about leadership skill as it is a life skill. All interactions are a relationship at different degree. No matter who we communicate with, we work with letting the other person know their thoughts matter, that they are heard and that they aren’t judged for how they feel but how they decide to behave on those emotions. Thank you, for putting up those four questions. Now, I have something to work with. Perhaps there are times when “don’t want to” comes from a place of fear, lack of self-confidence, or and not being “good enough” to lead others. I checked out blogs which my fellow bloggers like, and you were liked by so many. Great post, I will return for more!